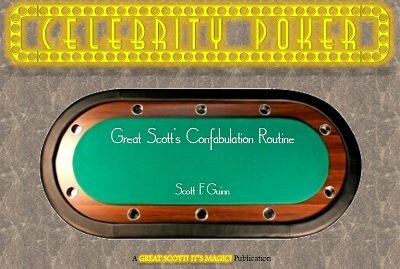 Celebrity Poker is Scott's exciting take on Alan Shaxon's "Confabulation" effect. This is a mentalism routine for parlor, platform and stage with lots of audience participation, comedy, and an extremely engaging presentation. The routine is very funny, super strong, super easy to do, and with one exception, the required props cost next to nothing at your local dollar store or Walmart. The good news: That one exception is readily available from magic dealers and it isn't very expensive--and you don't have to own it to do the routine! Scott gives complete instructions on how to do the routine without it. Effect: Everyone in the audience visualizes a famous actor from TV or the movies. The audience chooses someone to reveal her mentally chosen actor. Then everyone in the audience pictures that actor and a few of his friends, sitting around his table eating a specific food. Again, at the whim of the audience, a person is chosen to reveal the food he pictured. The audience then selects another person, who in turn chooses two other people. Everyone visualizes the chosen actor and his friends eating the chosen food while enjoying a poker night. These two people work together to choose which card will be the celebrity's in a "winner-take-all" hand of high card. In the fairest possible way, you reveal that you have correctly predicted the card, the food, and the actor, in spite of the fact that there has apparently been a problem and the situation seems to have gotten out of hand! There is virtually no sleight-of-hand involved. The routine is very easy to learn and perform, but comes across as a miracle. The presentation literally involves the entire audience, both mentally and physically. No stooges, electronics, pre-show work, impression devices, double-writing, etc. Scott's full professional script is included.